Whether you measure and monitor conditions for flooding, road weather, aviation, fire, or avalanches, your data is important to you and those with whom you share it. Oftentimes, sharing your data quickly is critical, as conditions may change rapidly and require prompt action. 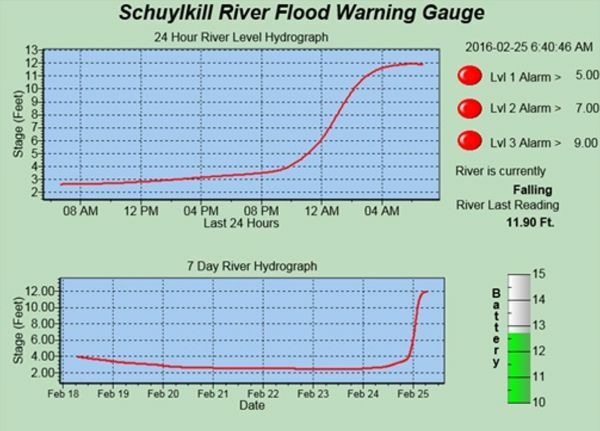 In this article, we’ll look at a real-world example where tweets, a web page, and email messages were used to send alerts regarding monitored river levels to decision makers and the general public. The Schuylkill River in central and eastern Pennsylvania is roughly 130 miles long and joins the Delaware River, as its largest tributary, in Philadelphia. There are both residential and commercial properties along the river that are, unfortunately, subject to flooding during significant storm events. Because of the known flooding history, township officials identified the need for a local, automated gaging station that would provide real-time information and updates about the current water levels in the river. After many conversations about system design options, it was concluded that the most effective design would be a gaging station with a built-in web page and notification system. 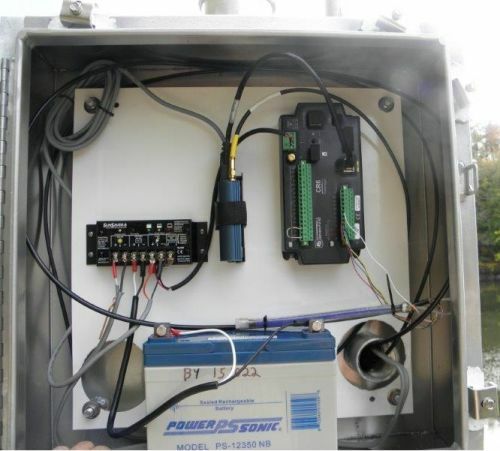 The gaging station consists of a Campbell Scientific CR6 datalogger, a CS451 submersible pressure transducer, a 35 Ah 12 Vdc battery and 20 W solar charging system, and a RavenXT cellular digital modem. The Campbell Scientific system measures the river’s water level every 10 seconds, and the data logger records 1-minute and 5-minute interval averages of the measurements. The logged data is used to populate the gaging station’s internal web page. The web page returns current readings, long-term trends, and alarm states to aid in decision making. Recommended for You: To see how you can use RTMC Pro to set up your data logger as a web server, watch the "RTMC Pro Software | Publishing Data" video. Anytime the water level reaches a defined alarm threshold, the data logger sends out level-specific email and text notifications to emergency responders and public officials. Selected individuals receive a daily noon-time email digest. In addition, maintenance-related notifications, such as low battery or intrusion, can also be sent out. Although the internal web page is intended for emergency responders and public officials, recent extreme flooding events demonstrated the importance of notifying the general public about hazardous conditions. 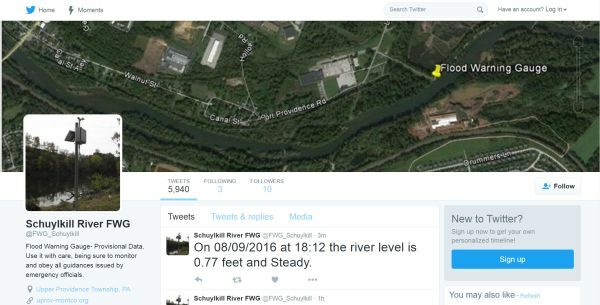 Township officials identified social media as a viable channel for this purpose, and they created a Schuylkill River FWG Twitter account for the gaging station. The account was configured to send out hourly tweets of the current river level as well as tweets whenever an alarm threshold is reached. In July of 2016, township officials opened up the Twitter page to the general public so that anyone can follow it. In the future, they plan to embed hashtags in appropriate tweets to better enable followers to stay informed. 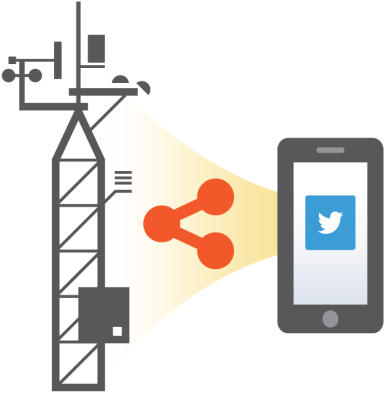 In the example described in this article, using tweets, a web page, and email messages to share the monitored data from a gaging station has proven to be a cost-effective alternative to building and maintaining a network or infrastructure to get data from the gaging station to a traditional flood-warning base station computer system. The designers of this system believe that this general approach can be a great option for small municipalities or communities with reliable cell phone coverage. In addition, this solution could also be adapted for satellite or spread-spectrum license-free radios. This article has briefly illustrated how you can use social media to inform interested parties (including the general public) of changing monitored conditions that they care about. To learn more about this real-world example, read the “Pennsylvania: Flood Warning” case study. To discuss how you can share your monitored data using Campbell Scientific equipment and social media channels, submit an Ask a Question form. Dr. Barbra Utley is an Application Research Scientist in the Water Resources Group at Campbell Scientific, Inc. She works with both the Marketing and Engineering Departments on water resources product testing and development. Areas of interest include water quality and surrogate sediment measurements in fresh water systems, as well as statistical analysis. Barbra has a doctoral degree in Biological Systems Engineering with an emphasis in Water Resources.